Sweet basil and marigolds in the tomato bed. season is long, so that I sowed the seed directly in the ground. The variety is Straight 8, which we've found to be so-so. Popcorn has tasseled and is doing well. amaranth. The purple-pink flowers top left are crepe myrtles. Spaghetti squash. It's been a long time since I've grown these. Sweet potato vines have been nibbled on, probably by deer. In the bottom right corner is the largest of several volunteer kale plants. And how is your garden growing? Our neighbor came by yesterday to let us know that he had just seen two coyotes passing across the back of his property toward the back of ours. Because coyotes haven't been seen around here in a long time, he initially thought they might be German Shepherds. As he observed their behavior and play, he realized they were coyotes. This is not good news. We live outside of a small town which has it's shopping centers and housing developments, but is surrounded by a lot of rural land. Of wildlife we've personally seen deer, opossums, rabbits, groundhogs, fox, and wild turkey. There is, however, little agriculture. Our town, like many others, was based on textile mills which have long since closed down. This not farming country. There are some who keep cattle, horses, or Boer goats, and quite a few of these grow hay, but there are plenty of folks who simply keep a humongous lawn surrounding their house. It's not uncommon to see folks out on their tractors with mowing attachments, mowing acres and acres of ground just to keep it trim. Even our Cooperative Extension Office caters to this; ask them for information on what grows well in the area and you'll walk away with a stack of landscaping literature. Not surprisingly, our neighbor's news means we have been seriously discussing our options. 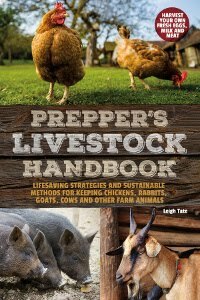 I've been researching the hunting habits of coyotes as well as how to protect livestock. Articles suggest things like fencing (7 feet tall recommended with one foot buried, also electric), lighting, housing, human presence as a deterrent, and guard animals (donkeys were at the top of the list followed by llamas, then dogs). Our goats, poultry, and cat are potential targets, but there are plenty of deer, rabbits, and groundhogs around so at least these coyotes aren't starving. Riley, a good night hunter, has lately been very cautious exiting the house. Still, we need to be on guard and do all we can to protect our critters. It seems a variety of measures would work best. We've started by locking the goats up at night. The rest, we have yet to figure out. 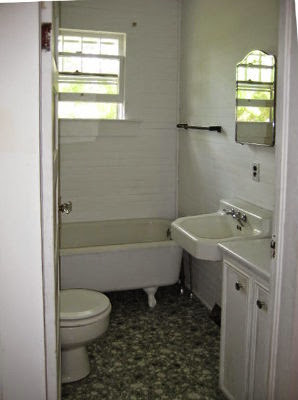 I am so happy with our new bathroom, or rather, our totally remodeled bathroom. 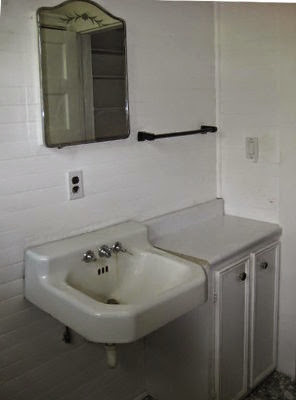 Our newly repaired and remodeled bathroom. It took us a year, start to finish, but we only worked on it sporadically. If the weather had been nicer we'd still be working on it because all the rain kept us mostly indoors, working on indoor projects. Following is a before photo, and several more befores and afters to highlight the repairs and improvements we made. Links to the various stages of the remodel are below as well. 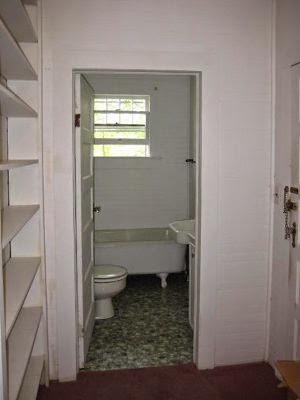 This is the hall bathroom when we first moved in. It's a small room, 7'3" by 5'4". We tore out everything: the hallway shelves and carpet, the bathroom vinyl floor, door, window, sink, cabinet, tub, toilet and outer wall. We kept the clawfoot tub but refurbished it. I chose my color scheme from the stained glass window. Dan fixed the floor first, then we installed a low-flush toilet. Only thing I'm still looking for is prettier shower curtains. Before. Unfortunately the hot water faucet never worked. The other problem was persistant clogging of the drain. After. The base cabinet is the same as in the before photo. 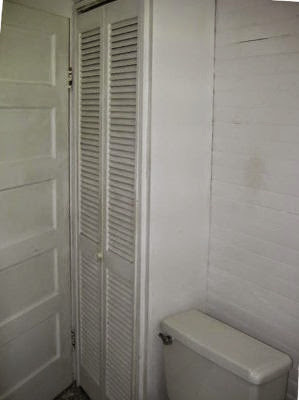 there is room for a waste basket and toilet paper holder. hardwood door will be reused as the new bedroom door. hook for a towel to dry my long hair, and a laundry basket. For extra towel storage and ordinary under-sink items such as cleaners, Dan built some shelves right outside the bathroom door. Washcloths are easy to reach for as needed. So that's another huge project checked off the project list. Almost finished is Dan's study, which I'll show you soon. Guinea fowl keets are the newest additions to the homestead. They arrived last Friday. We decided to get them after having so many problems with ticks last year. They are supposed to be superior insect eaters. They are smaller than standard breed chicken chicks, because guineas lay smaller eggs (2 guinea eggs = 1 chicken egg). In fact, I worried that the chick feeder would be too big. We ordered 15 from Cackle Hatchery. They sent us 2 extra. That worry turned out to be unfounded. Where there's a will there's a way and all that. They are quicker than chicks and dart around their brooder box like little speed racers. This is a new species for us, so most of what I know is what I've read. I can tell you that they are super cute. They are also hilarious when they crash. Baby chicks just squat down and nod off. Keets lay out flat with their legs sticking straight out. Shocking at first ("are they still alive?"). It took three tries to get it, but we finally caught our chick killer. It was a rat, and it managed to kill seven chicks before we got it. 7 of our chicks have been killed. Why it didn't go for the bait in the rat traps is a mystery; we've never before had a rat turn its nose up at peanut butter and cheese. This one, however, preferred raw chicken to grains, legumes, and cheese. We used a raw store bought chicken neck as bait. It couldn't resist that. It wasn't heavy enough to trip the trap door the first night, so it made clean away with the bait. The second night Dan added some weight to the trip plate, but it gnawed most of the chicken neck from the outside of the cage. Finally, Dan secured the neck with wire in the cage so that the critter had to enter. The concern now is whether or not there are more of them. We'll continue setting the trap for awhile, just to make sure there isn't something else. I haven't posted an Around The Homestead in awhile. These are bullet-like posts, where I can put random happenings, updates, and follow-ups to previous posts. Summer Weather. The summer continues to be cooler than typical and rainy. By cooler, I mean we've only had a few days that have reached 90° F / 32° C. Inside the house, the temperature has gradually crept up to about 82-83° F / 28° C. during the day, but we haven't turned on the air conditioner so far. 82° F is where I keep the thermostat set anyway. If I put a fan in the window in the early morning and after the sun goes down the house is warm but tolerable. I close it up during the day and keep both ceiling fans going. Of rain we had 9.35 inches in June, and 9.6 inches the first half of July. These are doing well, but the ground has been too soft and wet to do any lawnmower weeding. There is a large bare patch in the corn field, which Dan suggested I do another corn planting. I'm not sure if there's enough time before first frost, but I may try it anyway, as soon as the soil isn't so squishy to walk on. The blueberries are abundant but have been slow to ripen this year, I'm guessing because we've had so little sun.The wait's been worth it, though, because they are the plumpest and sweetest ever. Zed is still my bottle baby, although I've cut down on amount and frequency. He does love his bottle. I call, "Where's my baby," and no matter where he is, he comes running. I am very sad to say that we lost another chick. I had been putting them in their security quarters around dusk; still light enough outside to see, but dim in the chicken coop. I could put Mama in the cage, shine a flashlight on her, and all the chicks would run in after her. One night we were about half an hour later than usual. I only counted 18 chicks run into the cage. They move around so much they're difficult to count, so I finally gave up trying. As I secured the door, Dan found the dead chick near the same spot I found the other one. This one also had its neck bitten open. Needless to say Dan bought a live animal trap the next day. We haven't caught the sneaky little culprit yet, but hopefully soon. I tried to get him to stretch out well, but this was the best he'd do. Just because he hasn't been featured in awhile. Remodeling. The hall bathroom and Dan's study are almost finished, but I'll give them their own posts soon, with lots of photos. What finer summer treat is there than homemade ice cream? It's the one dairy product I hadn't made until I finally bought an ice cream maker. A long time ago we had a hand crank one, but it got left behind in one of our long distance moves. I'd often thought about replacing it, but considered that it would take awhile to save up enough milk for a two gallon ice cream churn. Plus, that would be a lot of ice cream for just the two of us. Somehow I found out about the newer small quantity electric models. They require no chipped ice nor rock salt, have a capacity of one and a half quarts, and make ice cream in 15 to 20 minutes. I would ordinarily prefer anything nonelectric, but because Dan isn't always home I know the cranking would fall to me. In that case, we wouldn't have ice cream very often. There are two kinds of ice cream recipes, cooked and not cooked. Cooked require making a custard of cream, milk, sugar, and egg yolks beforehand and chilling before putting in the ice cream maker. No-cook means mixing cream, milk, and sugar, chilling the mixture if there's enough time, and then making ice cream. Some no-cook recipes call for egg yolk as well. So far I've only tried the no-cook method. Time and planning are big factors. Plus we haven't had many eggs since the scare in the hen house. To date I've made vanilla, chocolate, strawberry, peach, and carob ice cream. Typical ice cream recipes for these small ice cream makers call for either 2 cups cream and 1 cup milk, or 2 cups cream and 2 cups milk. Because goats don't produce the volumes of cream cows do, (see how to obtain cream from goats milk can be found in my butter making post), I experimented with a lower cream recipe. I found that 1 cup cream and 2 cups milk still gives an acceptable, tasty ice cream. I also adjusted the sugar, because the 3/4 cup called for is too sweet, unless tarter fruits or cocoa powder are being added. Mix well and chill for as long as you have time for. Freeze as directed. Recipe Note: Pureeing the fruit beforehand is necessary, unless one wants rocks of hard frozen fruit in their ice cream. With no antifreeze added it does get pretty hard if it sits in the freezer for many days. I've learned to not store it in the ice cream freezer bowl and to take it out about 15 minutes before serving. Other than that, you can't beat it. Awhile back, I shared some research I'd been doing on herbs and vegetables as a source of vitamins and minerals for my goats ("DIY Vitamins & Minerals For Goats"). I haven't been exceptionally diligent at gathering and dehydrating these, but I have been working on it a little at a time. I've been working in small batches because of the how and where of drying them. My dehydrator is a five tray Excalibur, which I thought adequate for us, but seems kind of small for a winter's worth of dehydrated herbs and veggies for the goats. Fortunately leafy things dry quickly in it. chop & dry for goats. It provides vitamins C, K, and sulfur. Large, repurposed window screens are useful too, as long as the humidity isn't too high. (I have had some things get moldy on me.) They need to be kept undercover too, to protect them from all the rain we've been having. Commercial herb forumlations for goats always seem to be powdered. I don't have the equipment to powder large quantities of herbs, so I've been chopping them. The question is whether to chop them before dehydrating or after. Those going into the dehydrator get chopped beforehand, those dried on screens tend to get cut up afterward. It takes time either way but I find some of those dried stems are a little tough. For storage, I'm using one of my $1 Rubbermaid trash cans. Mixture of dried herbs. I give it a stir anytime I add something new. I find that with our humidity things that were dried crisp and crunchy tend to soften with time. As long as they were well dehydrated initially, they don't usually get moldy. dill - A, B6, calcium, iron, magnesium, manganese, phosphorous, potassium, and selenium and zinc in the seeds. I'll add things as they enter their growing seasons. I didn't include comfrey, which I'm drying separately; kudzu too. Both are a source of calcium. I also plan to dry blueberries and rose hips. Also flax seed and black oil sunflower seeds if they do well. I'm not calculating and measuring to get specific amounts of particular vitamins and minerals. I considered that at first, but decided there was no way I could know the exact nutrient content of what I collect and add. I'm going for variety. Goats go for variety too, when they forage; a bite of this and a bite of that. I'll feed this mixture as a top dressing this winter, adding a small handful to their ration. Besides the nutrition, I know they love the variety when forage pickings are slim. I figure every little bit helps. This is the third year we've had hen raised chicks. This is the first year we've had problems. This year we have an an upsetting loss of six chicks. Since we started with 25, I might not have noticed the first one missing, except that I am a habitual counter. I find myself counting things, whether they need to be counted or not. Chicks do need to be counted, however, so it was alarming to come up one short. After rechecking my count about a zillion times, I was at a loss at to where the one had gotten to. No body, no sign, just disappeared. After the second one disappeared into thin air, we became alarmed. The coop is fairly tight against intruders. It has a concrete floor, so no burrowing from underneath. 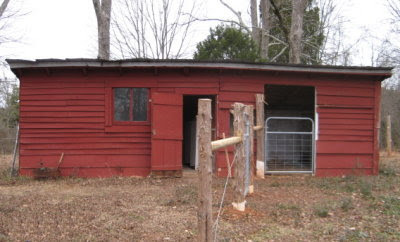 It has three solid exterior walls and one interior wall of 1-inch poultry netting. The windows are covered with half-inch hardware cloth. The building is shut up at night. Whatever it was, was either too sneaky or more than Mama could protect them from. We plugged the holes in the coop and set the trap near the back of the coop and waited. Although we didn't catch anything, all seemed well until a few days later. I was finishing up milking and it was just getting light enough to see around in the coop. I discovered a dead chick in the corner of the chick pen. It's neck was covered with dry blood. I began to count and realized three more were missing besides. We had to do something else. After racking my brain for a quick solution, I thought perhaps we could do something with our old homemade corn crib (photo in this post. It isn't at all like a traditional corn crib). We ended up cutting it down and covering it with half-inch hardware cloth. It became a bedroom for mother and chicks. Our failed "corn crib" becomes a chicken bedroom! We also considered it might be rats, and set out rat traps. So far we've caught nothing. Somehow Mama Buff managed to coax all 19 chicks into a nest box. Looks to make for rather precarious sleeping arrangements, however. I didn't really trust this arrangement, however, so they all had to be put into the safety cage anyway. We're down from 25 to 19 chicks: 6 Buff Orpingtons, 5 Speckled Sussex, and 8 Silver Laced Wyandottes. The other loss was my rare breed chick, which I figured out wasn't the black one, but a Golden Polish. So far we've caught nothing, but neither have there been other losses. I reckon as long as they bed down on the floor and can fit into the safety cage, I'll continue to put them up at dusk. Eventually they'll start roosting. Hopefully by that time they'll be too big for whatever has been killing my chicks. One thing this year's kidding season has shown us, is the inadequacy of our set-up for goats. We started with the existing outbuildings on the place, and have certainly been thankful for them. coop is on the right, feed storage & milking room are in the middle. than one side, otherwise there are arguments as to who owns it. put down plywood. Then the problem was who would possess the plywood. 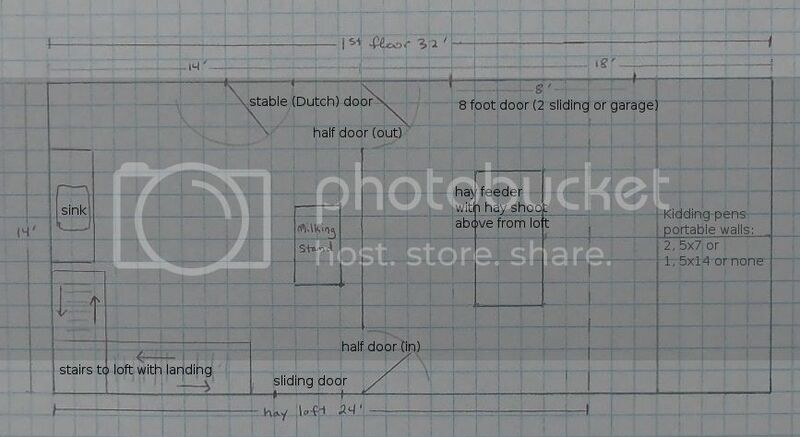 We've been dabbling with barn ideas ever since we moved here four years ago. I showed you one idea, in a post entitled "The Princess Is Peeved". That idea was only the beginning and has off an official barn brainstorming session. 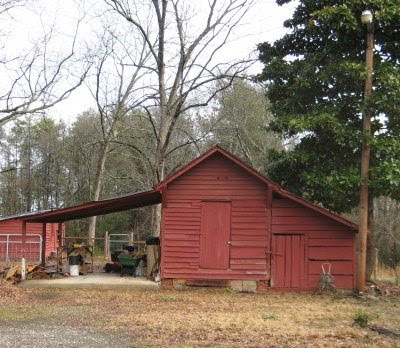 The idea we are favoring now uses the other outbuilding, the one we call the coal barn. the right still has a goodly bed of coal, once used to heat the 1920s built house. This building, including its carport on the left, measures 14 feet by 32 feet. The building is 14 by 18, and the carport 14 by 14. The carport has a cement floor and is currently used to store hay. The middle part has been Dan's workshop. We opened up the part on the right for garden tools and equipment storage. There are several reasons for tearing this down and building anew in it's place. For one thing, it's begun to lean a bit more since we've been using it, and the floor in the workshop is getting unsteady; we aren't entirely certain that it won't fall down on it's own. By using the same footprint, our property taxes won't be raised as much as if we built a larger barn. overhang on the right, which would function as a carport for our two vehicles. The goat area would be 14 feet by 18 feet most of the year, opening to a covered outdoor area. Inside on the right, I want to be able to set up portable panels as needed, to make kidding stalls, either two, 5 by 7, or one big 5 by 14. 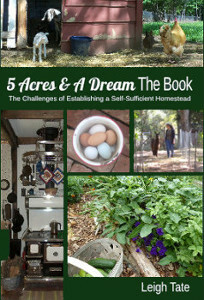 The hay feeder would be centered in the remaining space. Being accessible from both sides means no goat could chase all the others away, not without running around in constant circles anyway. We found this worked well in the new buck shelter. There would be a hay shoot over it, from the upstairs loft. A wide, 8 foot door will open out into an open, covered area, giving access to forage. The door would be either 2, four foot sliding doors, or perhaps a garage door, depending on what's most economical at the time. Our current 4 foot wide shed doors make it too easy for one goat to defend the shed, keeping all others out. A lean-to roof will not only provide a larger covered loafing area, but also protect the ground from rain and the ensuing mud! The carport would become the feed storage and milking room. The concrete floor means it could be hosed down if needed. I want entry and exit doors for the goats to prevent crowding at the door, as well as blocking to prevent the next goat from entering. The doors here would be half doors, so that I could see into the goat area. A sink with a point-of-use water heater would be wonderful. Cabinets and shelves would store equipment. Trash cans with stored feeds would likely be in the middle. Also in the milking room would be stairs going up to the 14 foot by 24 foot hay loft. Hay would be loaded into the loft with a pulley system. That's the plan at the moment. Good ventilation is important, but the exact location of windows is yet to be determined. Doors I'm more certain of. And of course any of it is subject to revision. There is much to be said for being patient and living make-do. I am thankful we have two outbuildings, even though they are old and in need of repair. They have not been ideal, but they've been a starting point. Even so, it's almost impossible to imagine this barn actually being built. Even a small barn will be expensive. Still, if we approach it like everything else around here, one day at a time, one step at a time, we may eventually see it done. My Field Corn: Sock High by the 4th of July?